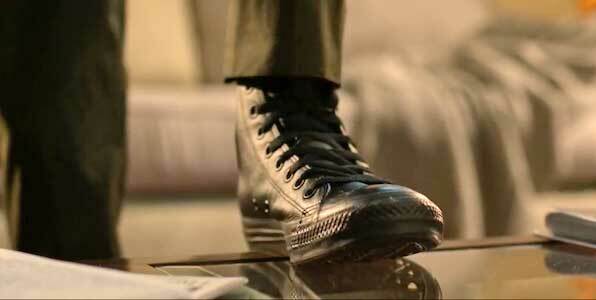 Tom Holland wears black monochrome leather high top Converse “Chuck Taylor” All Stars in the film. Laura Harrier wears optical white and grey high top Converse “Chuck Taylor” All Stars in the film. 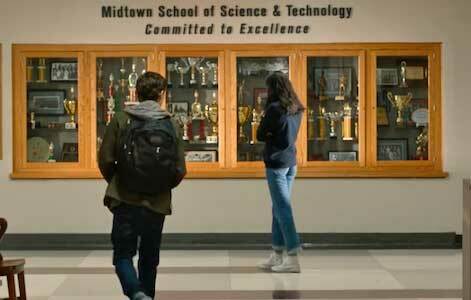 Liz Allen wears different pairs of chucks in Spider-Man: Homecoming. Spider-Man is undoubtedly the greatest hero Marvel Comics has produced in their near 80 year history. Spidey is often considered one of the most popular superheroes in the world, alongside the like of DC Comics’ Batman and Superman. In the world of cinema though, Spider-Man has hit a bit of a rough patch. Spider-Man 3 was a disappointing end to the Sam Raimi trilogy, and the Amazing Spider-Man films felt like a rushed reboot that was trying to do too many things at once. These three films have left many fans disappointed at the inability of filmmakers to tell a good story with one of the most beloved, well-rounded characters in comic history. So when it was announced in 2015 that Marvel Studios and Sony had reached a deal to share the character, allowing him to be included in the Marvel Cinematic Universe (MCU) alongside Iron Man, Thor, Captain America and Hulk, fans rejoiced and were hopeful that the wall-crawler was going to get his groove back. Tom Holland was cast as the web head, and first appeared in 2016’s Captain America: Civil War, bringing youth and a love for the character not yet seen. 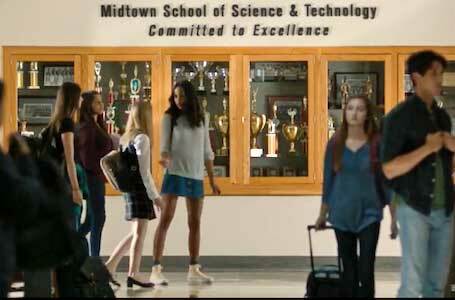 Spider-Man: Homecoming is Spidey’s first solo flick in the MCU, and sees the character return to his roots as a young sophomore in high school. Holland is joined by Michael Keaton, Zendaya, Jacob Batalon, Laura Harrier, Marisa Tomei, and Robert Downey Jr. The film begins with a look at the origin of the villain Toomes, a.k.a. the Vulture. He runs a cleanup crew that has secured the contract to cleanup New York City after the events of The Avengers. However, this is thwarted by the creation of the U.S. Department of Damage Control by Tony Stark. This ruins Toomes, and sets him down a path to become the Vulture. Fast forward to the events of Captain America: Civil War, which we now see through the eyes of Peter Parker. He returns home after the famed airport battle, and has to adjust to just being the everyday crime-fighter he is, stopping bike thieves, petty muggers, and giving directions to old people. We see he has attempted to maintain contact with Iron Man (the man who recruited him for battle in Civil War), but that communication has gone unanswered. A look at the gray pair of chucks Liz wears when she is rescued by Spider-Man. Peter spends his days at school as a “nerd” and a “loser”, alongside his best friend Ned. He has a massive crush on Liz Allen, the school's “it” girl. She’s beautiful, smart, and genuinely nice to everyone around her. She can be seen through most of the film wearing chucks, which helps make Laura Harrier (the actress/ model who portrays her) look and feel more like an everyday high school sophomore. For Peter, his day doesn’t really begin until that school bell rings, and he puts on his red and blue tights to become Spider-Man. 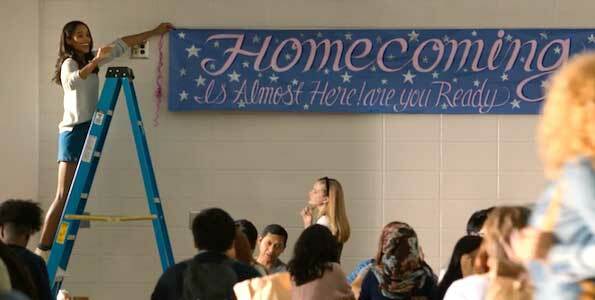 Liz gets the school into the homecoming spirit while wearing chucks. This film is very much a coming of age story. 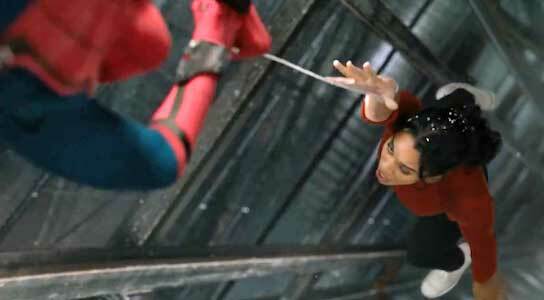 This version of Spider-Man is quite different than the ones portrayed by Tobey Maguire and Andrew Garfield. Holland’s Spider-Man is full of a youthful energy and charisma that none of the previous live action Spider-man possessed. This lets the audience see that we will be able to grow with him, and see his progression from small time hero to possibly the greatest to ever put on a pair of tights. He’s actually the age he was in his comic origin story, and it that sense, this Spider-Man may be the most comic accurate one yet. This youthfulness also allows the film to operate in the same vein as many of the coming of age dramedies that were popular in the 1980’s. While it still is very much a superhero movie, it shares a lot in common with movies like The Breakfast Club, Ferris Bueller’s Day Off, and Pretty In Pink. There’s the budding awkward romance between Peter and his crush Liz, along with the everyday torture that is high school from bullies like Flash Thompson. We get to see Peter juggle this already crazy life, while also learning how to be a superhero from his mentor Tony Stark, a.k.a. Iron Man. This movie serves as a spectacular jumping off point for this young Spider-Man the MCU and, with it confirmed that Tom Holland will be Spider-Man for two more solo films and two more Avengers films, it’s going to be a fun ride watching him grow up over the course of the next few years. Things go south for Peter’s friends when they visit the Washington Monument. Peter says goodbye to Liz. The best chucks scene in the movie comes from the beginning of the film’s climax. Peter has just successfully asked Liz to Homecoming. He rushes home to get May’s help in getting ready. They dress him up in a suit and tie, and black leather chucks that are shined right in front of the camera. It’s in this scene that Peter finds out Liz’s dad is actually the Vulture. Toomes reveals that he knows who Peter is, and that he will kill everyone he loves if he interferes in his business again. He tells him that he needs to hang up the tights, forget this ever happened, and go to the dance with his daughter. Peter walks into the dance in shock, tells Liz he needs to go, and finds his old suit to go do battle against Vulture because he cannot look away again. In this scene we not only see Peter get to dress up for the homecoming dance in chucks, but we also get to see him spring into action in them. This scene is a great kickoff to the climax, and finale of the film highlighting how Peter will ignore the threats of any super villain if it means doing the right thing. That mentality is what makes Spider-Man one of the greatest comic book heroes of all time, and it’s refreshing to see this film treat him with the respect he deserves. Peter polishes his all black homecoming chucks. Spider-Man: Homecoming. (2017) Tom Holland, Laura Harrier, Michael Keaton, Zendaya, Jacob Batalon, Laura Harrier, Marisa Tomei, Robert Downey, Jr. Directed by Jon Watts.